Rugby Town’s new Academy side made a successful start to their competitive season by reaching the semi-finals of the Premier League VAR Trophy at the FA’s National Football Centre at St. George’s Park. The competition was organised by PGMOL - the professional referee’s association - and Liam O’Neill’s side acquitted themselves excellently alongside a number of other strong academy teams, narrowly missing out on a place in the final after a last minute 2-1 semi defeat to Dover Athletic. Earlier Rugby had recorded a 5-1 win over Aldershot in their opening game, and also enjoyed a five goal success against Pro Direct, with striker Lewis Corcoran leading the way on the scoring stakes in the tournament with an eight goal return. O’Neill looked back on the week with pride. He said: “It has a been a great experience for the lads. The set-up at St.George’s is superb and to win our first ever competitive game was a moment that I will never forget. 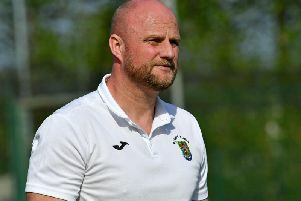 “The players were a real credit to the club, the team spirit was tremendous throughout and they have also showed their physical abilities in completing seven games in just three days. The Academy’s Under 19 team return to action on Saturday 28th July with an away game against Lutterworth Athletic first team, with further fixtures at Shrewsbury Town and Coventry City to follow on August 1st and 4th respectively.